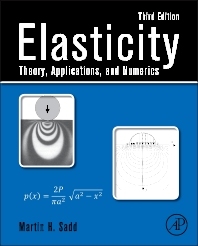 Elasticity: Theory, Applications, and Numerics, Third Edition, continues its market-leading tradition of concisely presenting and developing the linear theory of elasticity, moving from solution methodologies, formulations, and strategies into applications of contemporary interest, such as fracture mechanics, anisotropic and composite materials, micromechanics, nonhomogeneous graded materials, and computational methods. Developed for a one- or two-semester graduate elasticity course, this new edition has been revised with new worked examples and exercises, and new or expanded coverage of areas such as spherical anisotropy, stress contours, isochromatics, isoclinics, and stress trajectories. Using MATLAB software, numerical activities in the text are integrated with analytical problem solutions. These numerics aid in particular calculations, graphically present stress and displacement solutions to problems of interest, and conduct simple finite element calculations, enabling comparisons with previously studied analytical solutions. Online ancillary support materials for instructors include a solutions manual, image bank, and a set of PowerPoint lecture slides.